Kurban Bayram (Al-Adha) is an annual event organized by the Salsabil Association in the countries of Africa and the Middle East. This ritual is established by the Sunnah of the Messenger of Allah (peace and blessings of Allaah be upon him). Al-Adha is truly the Divine wisdom for all mankind that has come down to us since the time of the Prophet Ibrahim (Peace be upon him). This ritual encourages believers to show caring and giving mercy to the poor and starving people. Sacrificing from his property to Al-Adha, the Muslim thus approaches Allah (Glorious and Great) by this kind of worship. In Africa, there are a lot of people who are so poor that they practically do not have the opportunity to eat meat products. Many of them can eat meat only once a year, this opportunity falls into them only when humanitarian associations implement food projects. The Association Salsabil pays special attention to countries in which thousands of people die of malnutrition and hunger, most of them infants and young children. The sacrificial animals purchased for your donations are slaughtered in accordance with all the canons and rules of the Sharia. The meat obtained in the course of this process is rightfully assigned to the nascent categories of individuals, as it is envisaged by the Islamic faith. Senders of the Salsabil Association send us donations from around the world. The largest sponsorship activity comes from senders living in countries such as Russia and the CIS, as well as in the countries of the European Union. All of our funds are invaluable support for helping hungry people in the African continent. After the announcement of the project, the employees of the Salsabil Association carefully monitor each money transfer intended for the Al-Adha project. Lists with data of senders and amounts they donated are compiled, and a full financial report on the receipt of money on the accounts of the association is also maintained. 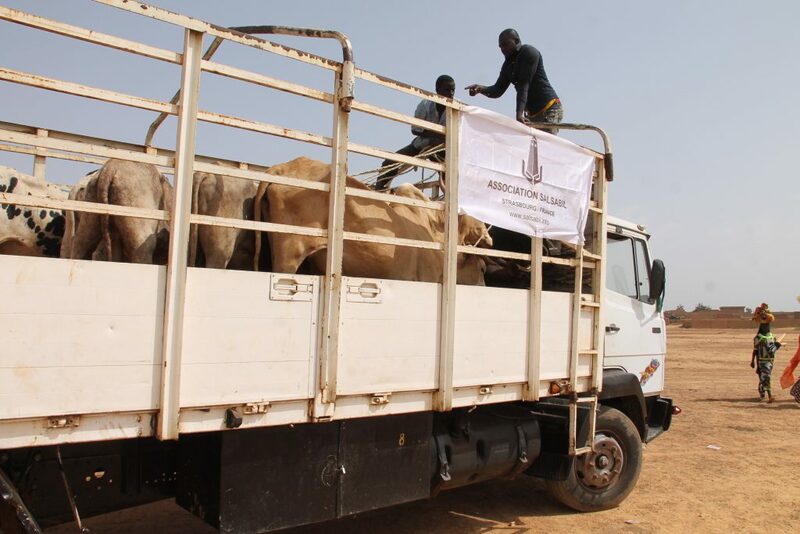 Employees of the AU themselves travel to the countries of the project, personally participate in the purchase of livestock and produce their further slaughter, with the subsequent distribution of meat among the local population. During the period of work, the Association Salsabil realized the Al-Adha project in such countries as: Somalia, Benin, Togo, Ethiopia, Niger, Syria, Kenya, Ingushetia and Georgia. From 2013 to 2015, during the Kurban project, the recipients of the project were 6428 families (60,300 people). We ask Allah that He accept all the sacrifices made for the alms of our senders (Amin! ).